I look at my arm, it’s got a bunch of hairs on them, up to nearly an inch long. I blow on them, they move. I blow very gently, ONLY ONE HAIR MOVES! That one there. It’s a longer hair, kind of lonely out there on its own, it’s also a bit kinked. So, here I’m theorizing, that hair is an older hair, that’s nearly at the end of its life cycle, it’s kinked because its internal structure is breaking down, making it lose rigidity. As it’s at the end of its life cycle, its root will not be firmly embedded in the follicle, in fact there is probably another hair growing, pushing it out. I can blow very very gently towards that patch of skin, and I can’t feel the air movement at all. yet the hair still moves and occasionally a few other very isolated hairs move. Since I can do this, it seems quite possible that small air currents might do the same. The point is Patti – there is an explanation as to why only individual hairs move. I was able to demonstrate this with just a few minutes of experiments. There are probably several other explanations as well. There is no need to go for the most complex explanation possible, just because you can’t immediately think of a simple explanation. I knew I would get a response with that sentence and considered leaving it out since there is not room enough here to say all that is involved. Although I appreciate you trying to explain this for us, don’t you think if it was that simple, we would have figured it out long ago? I wasn’t talking about hairs on my arm nor was I indicating that blowing on them caused movement, though I am certain that it would. That theory/experiment was one of my first ten years or more ago and believe me, I wish it was the answer. I don’t have time to go into this right now but the only way we will get you to even consider this as being possible is to show you how this happens. I don’t know how to accomplish this but if there is a chance of you meeting up with one of us, we would gladly educate you with a visual little shop of fibers….you will be a believer afterward, this I would bet my life upon. More later, have a good one! So you are saying that you have exhausted every possibility except for an unknown pathogen causing the hairs to move? Perhaps it is an unknown autonomic nervous reaction? Fits the bill equally well, yet it’s boringly harmless. Since Patti didn’t have time to expound on her thoughts regarding your *way too simple theory*, I will take a moment to try and enlighten you. About what possibilities have been considered and ruled out, you will have to ask the research board about what they have and haven’t concluded. As for an unknown autonomic nervous reaction, consider what could cause such a thing and remember, the fibers are only a part of what we suffer from. There is so much more that is equally frightening and hard to believe. But about the fibers; have you ever seen a cobra doing its dance, waving its head back and forth with numerous bends in the body? This is what our “fibers” look like and much of the time the bottom part never even moves – or if it does, it also has grooves and bends in it. When you see decorative grasses blowing in the wind, they bend and sway back and forth from the root up, but our fibers bend from the middle and strangely move about just as a snake does. Unless you’ve seen this, you cannot fathom the strangeness and pure unbelievability of it all. If it were as simple as hundreds of thousands of people blowing on arm hairs, do you really think the distinguished doctors and scientists working on this would risk their reputation and integrity on something that a 2-yr. old could have figured out? If you really want to blog a fair and accurate accounting of this disease (and have the wits scared right out of you), you will have to see it for yourself. I am another one that would stake my life on you not only believing the unbelievable once you see it, I don’t imagine you would know quite what to say afterward. As with us, there would be no accurate way for you to describe it so your readers would believe you. On a lower level, you would then feel the very frustration we feel every day of our lives. There is just no explaining this and only a true sufferer would understand. But thank you for trying. Static? Try rubbing a balloon on the carpet, and then holding it over your skin. The hairs move very much as you describe. Goosebumps? Various psychological (fright) and physiological (cold) triggers can make your hiars stand on end, and it can be quite localized. If it really is “strangeness and pure unbelievability” then it sure sounds like a pretty interesting research project. I can’t imagine that if you could actually demonstrate something new to science, then a scientist would not want to investigate. Surely you know someone with a video camera? And a large magnifying glass? Exactly what area of the body are we talking about? What do you think we’ve been working on all these years? We didn’t immediately come to these conclusions, it took several years just for us to even believe this was happening yet could not be explained in a rational manner. We have been led/forced to the most complex explanation as none of the others fit. Don’t you tink we would have started with the most obvious and worked our way up? I guarantee we have explored all areas of common sense in trying to explain this but it is not there! But you never mention these tests and experiments. You just leap directly from “hair moves oddly” to “unknown pathogen” – thereby inviting others to do the same. List for me the theories you have tried and disproved, then I’ll believe you have something new to science that is making tiny fibers dance in unison on your skin. I’ve watched many of these “so-called” hairs jettison out of my skin. They shot several inches out of the skin in an instant, and remained attached at one end, as if they were hairs. This occurred at times when I was highly toxic, and when a gelatinous material was pooled beneath or within the layers of skin. The pore served as the orfice so that the hair-like filament could be extruded. The filament dried as it contacted the air. 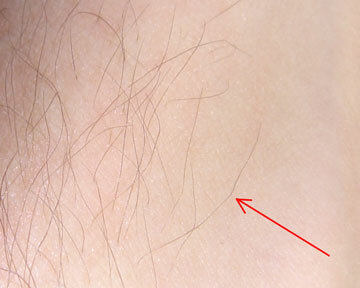 These “hairs” were usually transparent. I don’t know with a certainty, but I believe that these filaments were statically charged as they formed. Did anyone else see them? As a matter of fact, they did! !